The following article was kindly sent to us by Paul Ford, who is the Senior Archivist at the Walsall Local History Centre. He is also the writer of Wyrleyblog and a link to his website can be found at the end. After having the fortune of finding so much information on Harry Griffiths, I was again to return to the frustrations of not being able to find a war record for my next chosen soldier – Theodore Crescens Bason. I am going to start with a familiar photograph, then ask the reader what is strange about it? For the eagle-eyed among you, Bason is the only soldier that falls outside of the alphabetical arrangement by surname. It was this quirk that attracted me to research what I found to be Great Wyrley’s only fallen officer. Saying that, the two Smiths on the next plaque fall out of sequence, but by first name only (I believe that to be an error – but more on that in a future article). So, with all the errors on the Wyrley gates, is there another error here? The answer in this case is emphatically, no. I started with the question of identification. Bason appears on the Wesleyan Methodist plaque as Crescens Bason and he is, on that plaque, in correct alphabetical order. 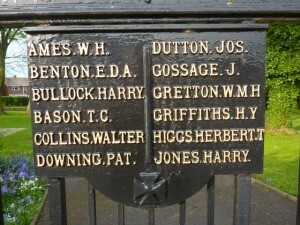 He is also on the war memorial gates in Oswestry, as Crescens Bason; he seemingly used his middle name a lot. Further, every record I have found that relates to this man has him as Bason. So, why is he out of sequence on our gates? Well, I can offer a theory that is supported by the 1926 Staffordshire Roll of Honour. 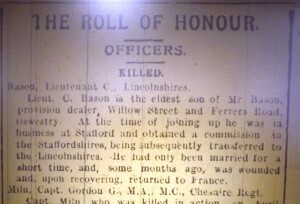 The roll has one error, and this is it: Bason is listed as Buson, a name which would actually fall into the correct alphabetical order on the memorial gates. I can only suggest that Bason would have originally appeared on the gates as Buson, but the error was noticed at some very late stage and rectified. The Oswestry War Memorial Gates, showing Crescens Bason. 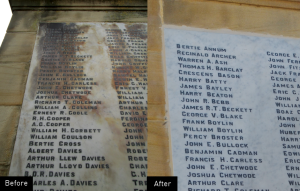 Before and after restoration by the War Memorial Restoration Co – the image is theirs and I hope they don’t mind me using it. As ever, we start with Bason’s early life. He was born in Oswestry, either in December 1889 or in the opening months of 1890. His father was Charles Henry Bason, a Wolverhampton man by birth and son of a Shropshire ‘provision dealer’. His mother was Harriet Venables, a farmer’s daughter from Kerry (Ceri) in Powis. The couple had married in Powys in 1888, when Charles was 22 and Harriet a year older. 10 Willow St, Oswestry. This is possibly the building that Charles Bason had as his grocery business. 2015. By 1891, Charles Bason had moved to his father’s county of Shropshire, with the couple settling in Oswestry. 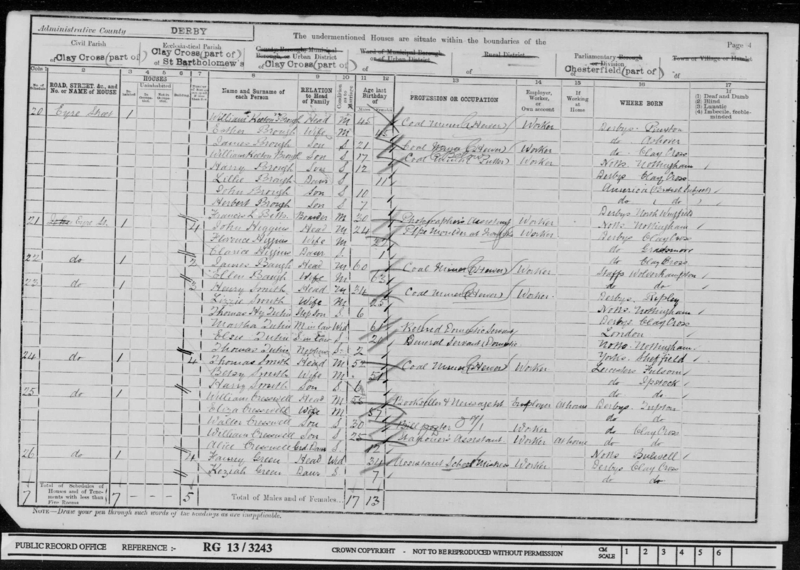 Further, Charles had set himself up, like his father, as a ‘provision merchant’; he operated from a premises at 10 Willow St. Interestingly, his parents use Theodore’s middle name on this census rather than his first name. I have currently found no link for Crescens being a family name either through the Bason or the Venables lines. The household is completed with Louisa Thomas, a 14 year-old domestic servant. I would wager that Charles’ business was successful, due to the fact that he had secured a second home by 1901. I suppose it is more accurate to say that Charles had in fact retained 10 Willow St as his trading premises, but had purchased new living accommodation at 20 Ferrers Rd, Oswestry. New is in fact the word, as Ferrers St was laid out and its houses built probably within a few years of the census and indeed, I would suggest, that Bason may have been the first owner of the house. In 1900, it would have been seen as a nice ‘middle-class’ three-storey sub-urban property; it has a front facing gable and the nice Victorian trappings of a finial and decorative roof coping. 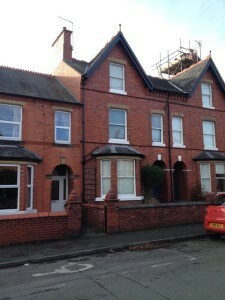 20 Ferrers Rd, Oswestry. The new Bason family home, while the business was retained at Willow St. 2015. 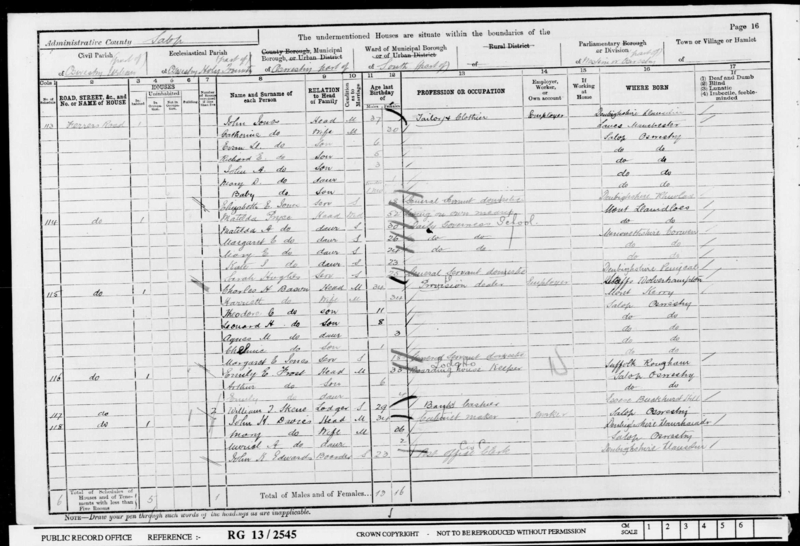 The Bason family were listed at their home address on the 1901 census. Charles is still listed as a ‘provision dealer’, but there is the added comment that he was also an employer – in other words, it wasn’t a family operated business. I guess the new house also suggests this. The family had grown, the 11 year-old Theodore (not Crescens) has been joined by brother Henry Leonard (aged 8), sister Agnes Mary (aged 3) and baby brother Chelmic (aged 1). Again, the 1901 household was completed with Margaret Jones, a local 18 year-old lass, who was employed as a domestic. 1901 Census for the Bason family, now at their family home in Ferrers Rd. Theodore would be joined by further siblings: in 1902, Charles Cyril was born and in 1908, Olive. By the time that Florence was born in 1913, Theodore would be well on his way to forging his own path in life. That path would take him to the ends of the earth, well, to Wales at least 🙂 . 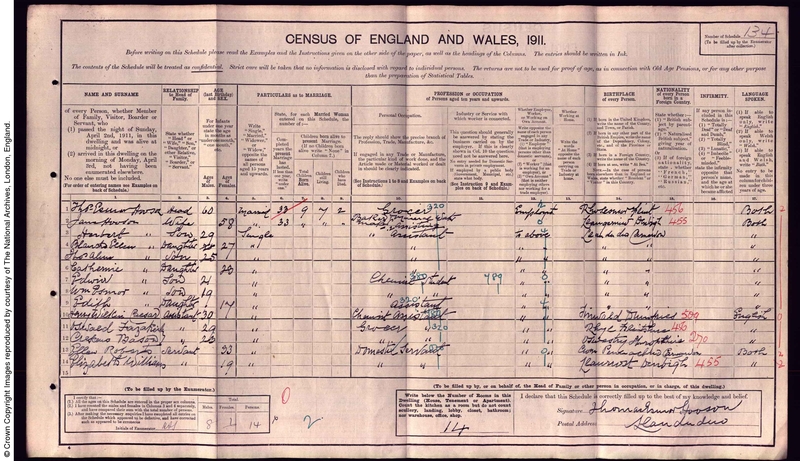 In 1911, the census shows that he was living in the shadow of the Great Orme at Llandudno. Thoedore, this time again listed as Crescens, was residing at 96 Mostyn St, Llandudno. Mostyn St is in fact the main ‘high street’ of the town, running parallel to the promenade road. The property was clearly a substantial one; the census shows it has more occupants that Noah’s Ark 🙂 . The property was owned by a Thomas Esmor Hooson, a 60 year-old grocer and entrepreneur from Flint. It is unclear as to whether Jane, his wife, was a baker and mineral water maker, or these talents were in fact ascribed to Thomas. Thomas’ four eldest children and his youngest daughter were assistants in the business. Interestingly, his next two sons were chemist students – and the fact that there must have been a pharmacy attached to the store is shown by the 30 year-old Henry Caesar being described as ‘chemist assistant’. Both the 29 year-old Oswald Fazakerley and Crescens were then both described as ‘grocer’s assistants’. The household was completed with two domestic servants. Theodore working in Llandudno, 1911. Theo’s military record does not survive, but we can piece together a little of his life and career from the several small newspaper accounts that can be found, along with his marriage entry, medal records and death registration. Saying that, from this point the search becomes increasingly frustrating: this is because some of the surviving evidence is very laconic, some appears contradictory and some may be plain wrong. We do know that Theo’s Welsh escapade would last but a few years, as by 1914 he is to be found in Stafford. We know he was in business, but can only speculate that it is most likely as a grocer or, on a slightly wider food front, a provision dealer. We also know that in the September of that year he attested into the military. His obituary in the Oswestry and Border Counties Advertizer (yes, they spell it with a Z) said that he went into Staffordshire Regiment, where he obtained a commission, before moving to the Lincolnshire Regiment. This, I believe, is completely wrong. Theo’s obituary in the Oswestry & Border Counties Advertizer, May 1918. It is possible that he was a Special Reservist or a Territorial, because the first regiment I can associate him with is the Gloucestershire Regiment – and this is not until April 1917. According to his medal entitlement, he was only entitled to the British War Medal and the Victory Medal: this means that he did not leave Britain until 1916 at least. Further, his medal card and his obituary in the Cannock Advertiser only place him in France from April 1918 and his death record places him as in the Manchester Regiment, as an officer – so just what is going on? Well, I wonder if his experience in the grocery and provision trade has meant a home posting; I was especially thinking of serving at one of the many military camps in food logistics or indeed food preparation. A few years back, I dealt with a family collection of papers where the grandfather of the depositor worked in the bakery/cake department of the Walsall Co-op – and he was sent to the kitchens at a military camp in Yorkshire. So, the first we can really pick-up of Theo is in April 1917, when he bizarrely turns up in the Gloucester Journal – the local newspaper. The 14 April edition has an entry in the roll of honour section which laconically states that a Corporal T.C. Bason of the Gloucestershire Regiment, from Oswestry, was wounded. Now, Bason had not gone abroad according to surviving records, so his wound could only have come from home service (I can’t trace any battalion to Ireland). Whatever the truth of this wound, it may never be known. The next we pick-up of Theo is in Great Wyrley. Just how long he had been courting Keziah Green we cannot say, but he married her on 13 August 1917 at St Mark’s Church. Bason had been promoted to a sergeant by this stage, but was still in the Gloucestershire Regiment. A write-up of the event can be found in the following edition of the Walsall Observer. It describes the outfits worn and mentions that Chelmic Bason was best man, while one of Theo’s sister was a bridesmaid. It also mentions that the couple went on honeymoon to Rhyl. Bason’s address on the marriage entry is simply Stafford. Keziah, also known as Kitty, was born in Clay Cross, Derbyshire, in the middle of 1893. She was born to parents Thomas and Fanny Green, but Thomas, a butcher by trade, was dead with a few years. With no welfare state, Fanny was at least able to fall back onto her career as an assistant school mistress to keep a roof over their heads. 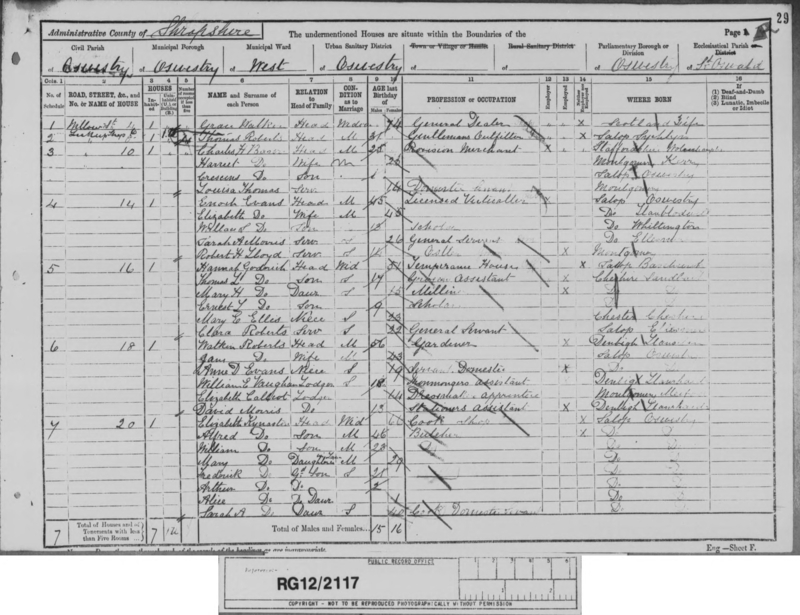 The 1901 census for Kitty and Fanny Green. By 1907, the pair had moved to Great Wyrley. In this year Fanny Green married a local miner, William Joseph Dutton. Dutton was eight years her senior. By 1911, the couple were residing at Ivy Cottages on the Walsall Rd. Fanny was 44 at this stage and still a school mistress. 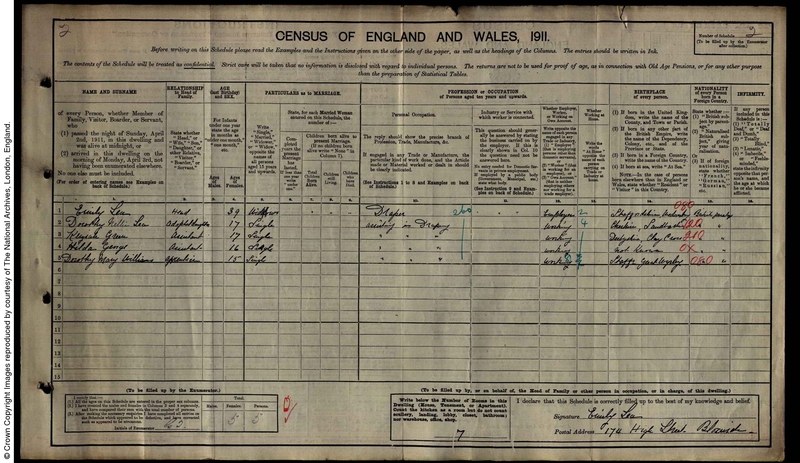 Although Keziah’s address was given as Great Wyrley at the time of her marriage, she was not registered at her mother’s address on the 1911 census. 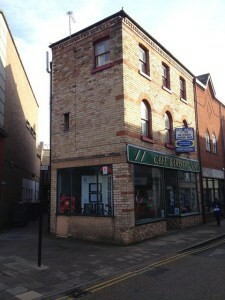 She was in fact to be found at Emily Lea’s drapery shop at 174 High St, Bloxwich. She was an assistant within the shop. So, after the Rhyl honeymoon, one can only assume that Theo returned to duties, whatever they actually were. It seems that things continued for another few months, until 29 January 1918 to be exact. On this date, what was actually Lance-Sergeant (a temporary promoted Corporal) Bason obtained a commission – he became a Second Lieutenant. Now, we know from his obituary that he entered a period of training for his commission, which took until the April. He was officially transferred to the Manchester Regiment, however, he may never have served with them – he was to be attached to the 1st Battalion, Worcestershire Regiment. We know from his medal index card that he arrived in France on the 11 April 1918. Bason walked straight into the most precarious situation since the start of the War: the high point of the Ludendorff Offensive – Germany’s last throw of the dice. We do not know when Bason became attached to the Worcestershire Regiment, but we do know where the 1st Battalion served and we do know that Bason was with them for the last few days of his life at least (my thanks for what comes next to the Worcestershire Regimental Museum Website). Bason was sent to the vitally strategic Amiens area; to be more exact, just to the west at Villers Bretonneux. Between 19-22 April, the 1st Worcestershire’s were in support trenches to the south of the village. Captured prisoners warned that the village would be attacked on 24 April. At 4 am, the suspicious quiet gave way to an intense bombardment, followed by a tank assault that was supported by infantry. The front defences were overwhelmed. The rear defences, including the 1st Worcestershire’s, held-up the attack with the help of some British tanks. Heavy fighting lasted throughout the day, but further attacks were driven-off by Worcesters and theDevons. An Australian led counter-attack was launched at 10 pm and by mid-day the following day had succeeded in driving the Germans out of Villers Bretonneux. The Worcesters were remained in their position throughout that day and until nightfall on 26 April. Then they were relieved. On 28 April, the Brigade moved back to billets in Camon. The War diary states that Bason was wounded at some stage over these few days. He was moved to the 47th Casualty Clearing Station, which was located at that time in the village of Crouy (16 km north-west of Amiens). He died of his wounds there on the 29 April, and was buried in the War cemetery there. 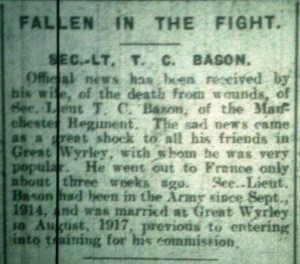 The second entry on Bason’s death in the Cannock Advertiser, May 1918. Keziah was notified. She placed the obituaries, one of which states how Theo would be missed by his friends in Wyrley and just how popular he was there. On 4 July she received £181 from Theo’s will, in which, interestingly, he was described as being from Great Wyrley. The couple didn’t have the time to start a family and Keziah would never remarry. She died a few days after D-Day in 1944, when she was living at 100 Eccleshall Rd, Stafford. In Memory Of Theo and Keziah.